The Surrey Vintage Vehicle Society is an all-make club catering for enthusiasts who share an interest in Veteran, Vintage and Classic vehicles and who live in the South East of England. The Society was formed some 50 years ago and currently has some 170 Members who live in the areas of London, Surrey, Sussex and Kent. The Society meets regularly throughout the year on the last Wednesday of every month. The above photo is of an evening meeting at the Plough Bletchingley. Winter meetings, September through to April, are now held at the 'Dog & Duck, Outwood, RH1 5QU. 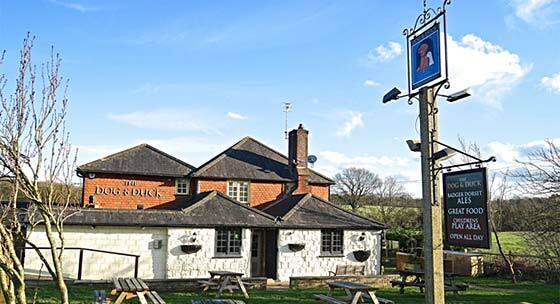 Photograph of the Dog & Duck Public House is shown below. For a map of how to get to the Dog & Duck, (marked as no 1 on the Map), and also how to get to all our other venues please click on the Map and Dates of Meetings on the menu top left. Parking facilities are ample and meetings are held in the restaurant. Winter meetings are designed to be informative and always involve specialist speakers all aspects of Veteran, Vintage and Classic travel and motoring. Speakers, with the aid of film, slide and video, have covered the histories of various Car makes, Buses, Commercial Vehicles, Fire Engines, Lorries, Bicycles, Motorcycles, Steam Vehicles, Tractors, Agricultural Machinery, Bi-planes, Commercial Aircraft, Military Aircraft, Helicopters, Parachuting, Fairground Engines, etc. Visiting Speakers from other Car Clubs also come to speak about their activities and specialist Speakers come to tell of their interesting and unusual motoring/travel exploits. Summer meetings are more informal and are held at various hostelries throughout the area. Generally there is one mid-month Sunday Lunchtime meeting and one end of month Wednesday evening meeting. Summer meetings are an excuse to bring out the cars and enjoy a reasonable drive in the countryside for a chat and a glass of pop with like minded enthusiasts. Additional organised events also involve group visits to transport museums and other places of motoring interest. The Society also provides group attendances at various local Vintage car shows and car venues, and similarly involves wives and families on society group picnics. The majority of S V V S Members are also members of other Clubs but regularly attend S V V S meetings because of the relaxed atmosphere generated by an all-make club rather than the more rigid disciplines of a one-make Club. Many Members are noted international specialists in the field of their own marque and some Members are also involved in companies specialising in manufacture and repair of historic components and vehicles. The Society has an active monthly Magazine with lots of articles and specialist contributions from many of the Members. A comprehensive Vehicle Register is kept by the Association and an updated copy is circulated regularly to the Members. Club regalia includes sweat-shirts, tee-shirts, stickers, badges etc. The Society has some 170 Members who between them have in excess of some 400 Historic Vehicles. Click to see the variety of the vehicle makes .